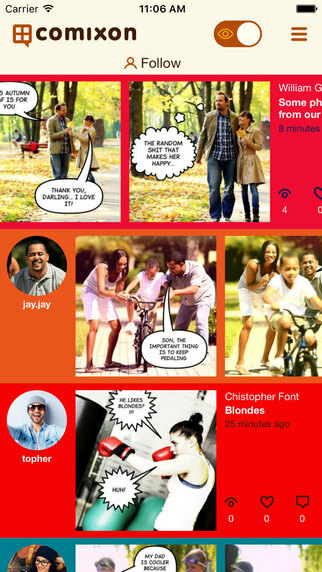 Published by Orange Rockets, Comixonis an iOS app designed to help you transform photos with friends and family into your own original comic strips. Before jumping in to creating a unique comic you’ll need to register – simply login using your Facebook or Twitter account or you can use email. Next you’ll need to select your first ‘Frame’ by uploading an image. This can be anything you’ve taken on your iPhone or added to your album, or you can opt to take a new photo using the built-in camera. Once you have a photo to work with, you can add speech bubbles and modify the style of the photo with a series of filters. The speech bubbles are in a familiar comic-book style and there are four main types to choose from, with editable text, re-sizing and re-positioning all made easy by intuitive on-screen controls. The entire interface is straight-forward and easy-to-use. Your editing tools are all laid out down the bottom of the screen, whilst your image stays up top. There are also four different image filters that you can apply to your frame, including the familiar dot-style of old comic books as well sepia, manga and lomo. You can add up to four frames per strip to create an interesting or funny story. Comixon isn’t just a comic-making app though, it’s also a social network in its own right. Featuring a stream of the top-rated user-made comics, you can browse through other people’s creations and like, comment or share. You can save comics that you find, or send to friends via email or Facebook. Comixonis a free download and well worth checking out. 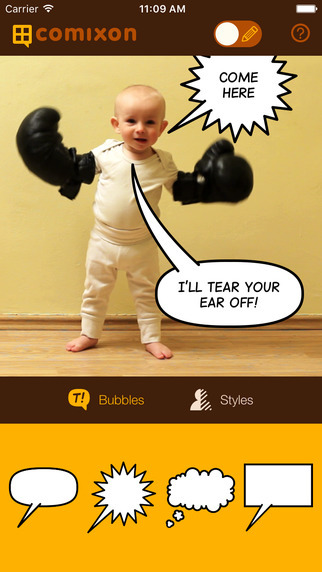 With the ability to create individualised comic strips of your own with custom speech bubbles and image filters, Comixon allows you to make some great share-worthy comics. Comixon requires iOS 8.0 or later. Compatible with iPhone, iPad, and iPod touch.